The Florida-based water filtration producer will donate filters to the Whaley Children’s Center following an advisory from local government officials advising that local water is not safe for consumption. The donation comes less than a month after President Obama declared the city to be in a state of emergency following dangerously high levels of lead detection in city water sources. 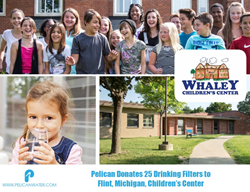 Florida-based Pelican Water Systems responds to the water crisis in Flint, Michigan, with the donation of 25 drinking water systems, complete with replacement filters, to the Whaley Children’s Center. City officials urged residents to stop consuming city water in October of 2015 after high levels of lead were found in children’s blood samples. Residents were also advised not to use unfiltered water for cooking or bathing, ultimately prompting state officials to issue a “state of emergency” in December of 2015. President Barack Obama would one month later declare a state of emergency. The consumption of lead through water can have serious and long-term health implications including damage to the nervous system, stunted growth in children, and the development of some learning and behavior disabilities. In that same interview, Whyte said, “The NSF-certified countertop drinking systems are small, compact and tested to eliminate 99.4% of lead.” Obviously, the filters do need to be checked regularly, but the systems have been tested to be very effective in removing lead from the water supply. Offering up to a year of purified drinking water through the use of additional filters, Pelican Water Systems provides some of best longevity for water filters on the market today. The increased lifespan of Pelican Water Systems’ filters ensure that residents of Flint, Michigan, who have been impacted by the water crisis have access to safe, purified water over the span of several months. Whaley Children’s Center is dedication to providing child trauma survivors with the necessary tools to reach their full potential. Through the leadership of a dedicated staff and the work of tireless volunteers, the Whaley family facilities have provided care, and treatment to hundreds of abused, neglected, and at risk children and families throughout Michigan for nearly a century. Based in Flint, Whaley Children’s Center is dedicated to treating their patients with fairness, dignity, and respect. More than just a treatment center, Whaley works to be leaders in the community as well. When paired together, a dedication to service and topnotch treatment provide hope to children and families who have survived trauma.